The two traditions may have evolved separately, but have influenced each other to a certain extent, particularly with the cross-cultural contact of recent centuries. The English word dragon and Latin word draco derives from Greek δράκων (drákōn), "dragon, serpent of huge size, water-snake". The word dragon entered the English language in the early 13th century from Old French dragon, which in turn comes from Latin draconem (nominative draco) meaning "huge serpent, dragon", from the Greek word δράκων, drakon (genitive drakontos, δράκοντος) "serpent, giant seafish". The Greek and Latin term referred to any great serpent, not necessarily mythological, and this usage was also current in English up to the 18th century. Dragons are usually shown in modern times with a body like a huge lizard, or a snake with two pairs of lizard-type legs, and able to emit fire from their mouths. The European dragon has bat-like wings growing from its back. A dragon-like creature with wings but only a single pair of legs is known as a wyvern. The association of the serpent with a monstrous opponent overcome by a heroic deity has its roots in the mythology of the Ancient Near East, including Canaanite (Hebrew, Ugaritic), Hittite and Mesopotamian. Humbaba, the fire-breathing dragon-fanged beast first described in the Epic of Gilgamesh, is sometimes described as a dragon with Gilgamesh playing the part of dragon-slayer. The legless serpent (Chaoskampf) motif entered Greek mythology and ultimately Christian mythology, although the serpent motif may already be part of prehistoric Indo-European mythology as well, based on comparative evidence of Indic and Germanic material. The folk-lore motif of the dragon guarding gold may have come from earlier Bronze Age customs of introducing serpents to village granaries to deter rats or mice. Although dragons occur in many legends around the world, different cultures have varying stories about monsters that have been grouped together under the dragon label. Some dragons are said to breathe fire or to be poisonous, such as in the Old English poem Beowulf. They are commonly portrayed as serpentine or reptilian, hatching from eggs and possessing typically scaly or feathered bodies. They are sometimes portrayed as hoarding treasure. Some myths portray them with a row of dorsal spines. European dragons are more often winged, while Chinese dragons resemble large snakes. Dragons can have a variable number of legs: none, two, four, or more when it comes to early European literature. Dragons are often held to have major spiritual significance in various religions and cultures around the world. In many Asian cultures, dragons were, and in some cultures still are, revered as representative of the primal forces of nature, religion and the universe. They are associated with wisdom—often said to be wiser than humans—and longevity. They are commonly said to possess some form of magic or other supernatural power, and are often associated with wells, rain, and rivers. In some cultures, they are also said to be capable of human speech. In some traditions dragons are said to have taught humans to talk. The Order of the Dragon was created to defend Europe against the invading Ottoman Turks in the 15th century. Narratives about dragons often involve their being killed by a hero. This topos can be traced to the Chaoskampf of the mythology of the Ancient Near East (e.g. Hadad vs. Yam, Marduk vs. Tiamat, Teshub vs. Illuyanka, etc. ; the Biblical Leviathan presumably reflects a corresponding opponent of an early version of Yahweh). The motif is continued in Greek Apollo, and the early Christian narratives about Michael the Archangel and Saint George. The slaying of Vrtra by Indra in the Rigveda also belongs in this category. The theme survives into medieval legend and folklore, with dragon slayers such as Beowulf, Sigurd, Tristan, Margaret the Virgin, Heinrich von Winkelried, Dobrynya Nikitich, Skuba Dratewka/Krakus. In the Bible, the archetype is alluded to in the descendants of Adam crushing the head of the Serpent, and in Christian mythology, this was interpreted as corresponding to Christ as the Last Adam crushing the devil. The blood of a slain dragon is depicted as either beneficent or as poisonous in medieval legend and literary fiction. In German legend, dragon blood has the power to render invincible skin or armor bathed in it, as is the case with Siegfried's skin or Ortnit's armor. In the Slavic myth, the Earth refuses it as being so vile that Mother Earth wishes not to have it within her womb, and it remains above ground for all eternity. The blood of the dragon in Beowulf has acidic qualities, allowing it to seep through iron. Heinrich von Winkelried dies after the blood of the dragon slain by him accidentally drips on him. There is a widespread belief that earlier cartographers used the Latin phrase hic sunt dracones, i.e., "the dragons are here", or "here be dragons", to denote dangerous or unexplored territories, in imitation of the infrequent medieval practice of putting sea serpents and other mythological creatures in the blank areas of maps. However, the only known use of this exact phrase is in the Latin form "HC SVNT DRACONES" on the Lenox Globe (ca. 1503–07). Another map that contains dragons is the one of Swedish bishop Olaus Magnus. The 1539 Carta Marina map of Scandinavia has many monsters in the North Sea and Norwegian Sea, as well as a winged, bipedal, predatory land animal resembling a dragon in northern Lapland. It has been speculated that accounts of spitting cobras may be the origin of the myths of fire-breathing dragons. Nile crocodiles, today very restricted in range, were in ancient times occasionally found in Southern Europe, having swum across the Mediterranean. Such wayward crocodiles may have inspired dragon myths. Skeletons of whales, as well as dinosaur and mammalian fossils may have been occasionally mistaken for the bones of dragons and other mythological creatures; for example, a discovery in 300 BC in Wucheng, Xingwen County, Sichuan, China, was labeled as such by Chang Qu. Adrienne Mayor has written on the subject of fossils as the inspiration for myths in her book The First Fossil Hunters, and in an entry in the Encyclopedia of Geology she wrote: "Fossil remains generated a variety of geomyths speculating on the creatures' identity and cause of their destruction. Many ancient cultures, from China and India to Greece, America, and Australia, told tales of dragons, monsters, and giant heroes..."
In Australia, stories of such creatures may have referred to the land crocodiles, Quinkana sp., a terrestrial crocodile which grew to 5 to possibly 7 metres long, or the monitor lizard Varanus priscus (formerly Megalania prisca) a giant carnivorous goanna that might have grown to 7 metres (23 ft), and weighed up to 1,940 kilograms (4,280 lb), or rainbow serpents (possibly Wonambi naracoortensis) that were part of the extinct megafauna of Australia. Today the Komodo monitor lizard Varanus komodoensis is known in English as the Komodo dragon. In the book An Instinct for Dragons anthropologist David E. Jones suggests a hypothesis that humans just like monkeys have inherited instinctive reactions to snakes, large cats and birds of prey. Dragons have features that are combinations of these three. An instinctive fear for these three would explain why dragons with similar features occur in stories from independent cultures on all continents. In Slovenia, Johann Weikhard von Valvasor compiled folk stories on the Olm, a subterranean salamander, in The Glory of the Duchy of Carniola. It is mentioned as a baby dragon. Heavy rains of Slovenia would wash the olms up from their subterranean habitat, giving rise to the folk belief that great dragons lived beneath the Earth's crust, and the olms were the undeveloped offspring of these mythical beasts. European dragons exist in folklore and mythology among the overlapping cultures of Europe. Dragons are generally depicted as living in rivers or having an underground lair or cave. They are commonly described as having hard or armoured hide, and are rarely described as flying, despite often being depicted with wings. 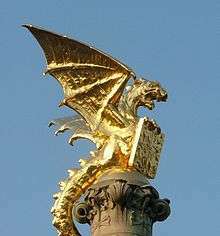 European dragons are usually depicted as malevolent under Christianity; pre-Christian dragons, such as Y Ddraig Goch, the Red Dragon of Wales, are seen as benevolent. Banners of the Late Roman Empire frequently figured Dragons, possibly due to the fact that Marcus Aurelius took over 8,000 Sarmatian soldiers into the Roman army, for whom the Dragon was a part of their military insignia. The double-headed dragon banner thus came to represent the division between Western and Eastern Roman Empires. It has been suggested that the Welsh legendary name Pendragon came from the word "head of the dragons", the name of the commander of the Sarmatians situated in sub-Roman Ribchester. Pagan sacred sites and springs, supposedly associated with Dragons, were often later associated with churches of Saint Michael or Saint George. The Lusignan family of nobility in France is said to have descended from the union of a count with the Lady Melusine, who married him on condition that he did not spy on her bathing. The count violated her privacy, whereupon she changed into a dragon and flew away never to be seen again. The city of Ljubljana has adopted dragons as a symbol as a result of the dynastic connection of its former ruling family with the Lusignan family of Melusine. In ancient Greece, the first mention of a "dragon" is derived from the Iliad where Agamemnon is described as having a blue dragon motif on his sword belt and an emblem of a three-headed dragon on his breast plate. However, the Greek word used (δράκων drákōn, genitive δράκοντοϛ drákontos) could also mean "snake". In 217 AD, Flavius Philostratus (Greek: Φλάβιος Φιλόστρατος) discussed dragons (δράκων, drákōn) in India in The Life of Apollonius of Tyana (II,17 and III,6–8). The Loeb Classical Library translation (by F.C. Conybeare) mentions (III,7) that "In most respects the tusks resemble the largest swine's, but they are slighter in build and twisted, and have a point as unabraded as sharks' teeth." According to a collection of books by Claudius Aelianus (Greek: Κλαύδιος Αἰλιανός) called On Animals, Ethiopia was inhabited by a species of dragon that hunted elephants and could grow to a length of 180 feet (55 m) with a lifespan rivaling that of the most enduring of animals. In Slavic mythology, the words "zmey", "zmiy" or "zmaj" are used to describe dragons. These words are masculine forms of the Slavic word for "snake", which are normally feminine (like Russian zmeya). In Romania, there is a similar figure, derived from the Slavic dragon and named zmeu. Exclusively in Polish and Belarusian folklore, as well as in the other Slavic folklores, a dragon is also called (variously) смок, цмок, or smok. In South Slavic folklores, the same thing is also called lamya (ламйа, ламjа, lamja). Although quite similar to other European dragons, Slavic dragons have their peculiarities. Russian dragons usually have heads in multiples of three. Some have heads that grow back if every single head is not cut off. In Ukraine and Russia, a particular dragon-like creature, Zmey Gorynych, has three heads and spits fire. According to one bylina, Zmey Gorynych was killed by bogatyr Dobrynya Nikitich. Other Russian dragons (such as Tugarin Zmeyevich) have Turkic names, probably symbolizing the Mongols and other nomadic steppe peoples. 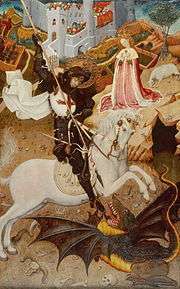 Accordingly, St George (symbolizing Christianity) killing the Dragon (symbolizing Satan) is represented on the coat of arms of Moscow. Some prehistoric structures, notably the Serpent's Wall near Kiev, have been associated with dragons. In the early Vedic religion, Vritra (Sanskrit: वृत्र (Devanāgarī) or Vṛtra (IAST)) "the enveloper", was a dragon or a "naga" (serpent) (Sanskrit: नाग) or possibly dragon-like creature, the personification of drought and enemy of Indra. Vritra was also known in the Vedas as Ahi ("snake") (Sanskrit: अहि), and he is said to have had three heads. In later Puranic mythology he came to be identified with an Asura. The Life of Apollonius of Tyana by Flavius Philostratus: contains a long detailed description of India heavily infested with dragons, but this does not correspond with modern Indian belief, and likely not with Indian belief as it was in his time, whether Apollonius invented this story, or whether he believed someone else who told him it. In Assam, dragon symbols are used in the Assamese Culture. Generally, dragons motifs are made for religious purposes. Such motifs are placed along the mukut in Naamghars. Dragons with a lion body are placed on the top of the gates of these Naamghars, which symbolises that they guard the ghar. 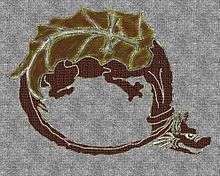 Dragon Symbols are also used in clothes. Such dragon was engraved in the seal of Ahom kingdom of Assam. Pakhangba is a mythical hybrid dragon of Manipur which originated in an ancient deity of the Meitei people preceding Hinduism in the region. It was the traditional heraldic emblem of the Princely state of Manipur. 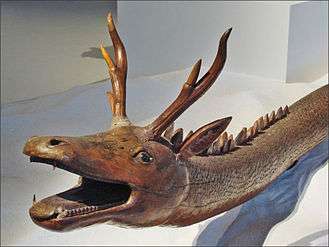 A Pakhangba is a dragon with deer antlers. It usually has the body of a snake, but in some sculptures at the Kangla Palace in Imphal, it is represented with a short body and four sturdy legs, looking more like a lion. Aži Dahāka is the source of the modern Persian word azhdahā or ezhdehā اژدها (Middle Persian azdahāg) meaning "dragon", often used of a dragon depicted upon a banner of war. The Persians believed that the baby of a dragon will be the same color as the mother's eyes. Several other dragons and dragon-like creatures, all of them malevolent, are mentioned in Zoroastrian scripture. (See Zahhāk). According to traditions, they have a huge body, a very scary face, their mouths are wide with lots of teeth, and their eyes are bright. Azhdahās are actually normal snakes, according to "Ajāyeb ul-Makhlooghāt", a book by Mohammad b. Mahmoud b. Ahmad-e Tusi (wrote in 1160 AD), "when a snake lives 100 years and its length becomes 30 Gazes, it is called an azhdahā". He also wrote that "because of their harassment to other creatures, the God eventually will throw them in the sea and in there, their body continue to raise, such that their length becomes more than 10,000 Gazes (a traditional measurement unit roundly equal to a meter). Then in the sea, they evolve to have two wings, like a fish, and the seawave is because of their movements. Eating the heart of an Azhdahā brings courage and bravery. Their skins are suitable to healing the wound of love, and if someone bury an azhdahā's head in a land, the conditions of that land will become good." In Shahnameh, the national epic of Greater Iran, dragons appear in a number of stories. Sām, Rostam, Esfandiar, Eskandar, Bahram V (Gur) are among the heroes that kill a dragon. In Jewish religious texts, the first mention of a dragon-like creature is in the Biblical works of Job (26:13), and Isaiah (27:1) where it is called Nachash Bare'ach, or a "Pole Serpent". This is identified in the Midrash Rabba to Genesis 1:21 as Leviathan from the word Taninim (תנינים) "and God created the great sea-monsters." In modern Hebrew, the word Taninim is used for crocodiles but this is a 20th-century usage unconnected with the original Biblical meaning. In later Biblical texts, the Book of Isaiah, the Book of Job, and Psalm 89 refer to a sea-demon called Rahab (not to be confused with Rahab, the woman of Jericho mentioned in the Book of Joshua). Isaiah 51:9 equates this Rahab with a dragon or monster. "Rahab" is the English transliteration of רהב (reb) with the several meanings: pride, a mythical sea-monster, or Egypt (as an emblematic name). In the Douay-Rheims version, translated via Medieval Latin from the Vulgate, the word reb is rendered "the proud one" in Isaiah 51:9 and Job 26:12 and "the power of the sea" in Psalm 88:10 (Psalm 88 is equivalent to Psalm 89 in other versions due to different verse numbering in the Vulgate). The connection between the sea-monster and "Leviathan the serpent" is made in Isaiah 27:1. In Jewish astronomy, this is also identified with the North Pole, the star Thuban which, around 4,500 years ago, was the star in the Draco constellation's "tail". However this can also have been either the celestial pole or the ecliptic pole. The ancient observers noted that Draco was at the top of the celestial pole, giving the appearance that stars were "hanging" from it, and in Hebrew it is referred to as Teli, from talah (תלה) – to hang. Hebrew writers from Arabic-speaking locations identified the Teli as Al Jaz'har, which is a Persian word for a "knot" or a "node" because of the intersection of the inclination of the orbit of a planet from the elliptic that forms two such nodes. In modern astronomy. these are called the ascending node and the descending node, but in medieval astronomy they were referred to as "dragon's head" and "dragon's tail". The Merthyr Synagogue features a dragon on the front gable. In East Asia, the concept of dragon appears largely in a form of a Long, a beneficent dragon-like creature from Chinese folklore. Another dragon-like creature is a Nāga, which is prevalent in some Southeast Asian countries with more direct influence from Vedic religion. 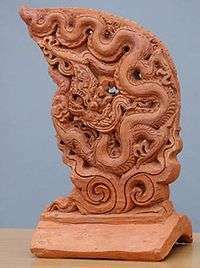 In China, depiction of the dragon (traditional:龍; simplified:龙) can be found in artifacts from the Shang and Zhou dynasties with examples dating back to the 16th century BC. Archaeologist Zhōu Chong-Fa believes that the Chinese word for dragon is an onomatopoeia of the sound of thunder. The Chinese name for dragon is pronounced lóng in Mandarin Chinese or lùhng in Cantonese. Sometime after the 9th century AD, Japan adopted the Chinese dragon through the spread of Buddhism. Although the indigenous name for a dragon in Japanese is tatsu (たつ), a few of the Japanese words for dragon stem from the Chinese word for dragon, namely, ryū (りゅう) or ryō (りょう) (traditional:龍;simplified:竜). The Vietnamese word for dragon is rồng (龍) and the Korean word for dragon is ryong (hangul:용, hanja:龍). 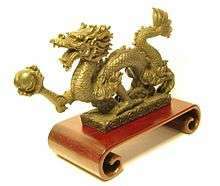 The Chinese dragon (simplified Chinese: 龙; traditional Chinese: 龍; pinyin: lóng) is the highest-ranking animal in the Chinese animal hierarchy, strongly associated at one time with the emperor and hence power and majesty (the mythical bird fenghuang was the symbol of the Chinese empress), still recognized and revered. Its origins are vague, but its "ancestors can be found on Neolithic pottery as well as Bronze Age ritual vessels." Tradition has it composed of nine different animals, with nine sons, each with its own imagery and affiliations. It is the only mythological animal of the 12 animals that represent the Chinese calendar. 2012 was the Chinese year of the Water Dragon. Vietnamese dragons (rồng or long) are symbolic creatures in the folklore and mythology of Vietnam. According to an ancient creation myth, the Vietnamese people are descended from a dragon and a fairy. To Vietnamese people, the dragon brings rain, essential for agriculture. It represents the emperor, the prosperity and power of the nation. Like the Chinese dragon, the Vietnamese dragon is the symbol of yang, representing the universe, life, existence, and growth. Extant references to the Vietnamese Dragon are rare now, due to the fierce changes in history that accompanied the sinicization of the Nguyễn dynasty. Sandra Martina Schwab writes, "With a few exceptions, including McCaffrey's Pern novels and the 2002 film Reign of Fire, dragons seem to fit more into the medievalized setting of fantasy literature than into the more technological world of science fiction. Indeed, they have been called the emblem of fantasy. The hero's fight against the dragon emphasizes and celebrates his masculinity, whereas revisionist fantasies of dragons and dragon-slaying often undermine traditional gender roles. In children's literature the friendly dragon becomes a powerful ally in battling the child's fears." In the early 20th century sculpture of the Norwegian artist Gustav Vigeland, inspired by Medieval art, dragons are a frequent theme—as symbols of sin but also as a natural force, fighting against man. 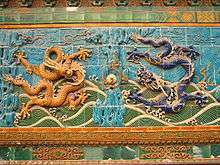 Dragons and dragon motifs are featured in many works of modern literature, particularly within the fantasy genre. Prominent works depicting dragons include J.R.R. Tolkien's Silmarillion and The Hobbit, J. K. Rowling's Harry Potter novels, Anne McCaffrey's Dragonriders of Pern, George R. R. Martin's series A Song of Ice and Fire, and Christopher Paolini's tetralogy Inheritance Cycle. Even by the 18th century, critical thinkers like Diderot were asserting that too much literature had been published on dragons: "There are already in books all too many fabulous stories of dragons". The popular role playing game system Dungeons & Dragons (D&D) makes heavy use of dragons, and has served as inspiration for many other games' dragons. Though dragons usually serve as adversaries, they can be either good or evil, with their alignment being determined by their species. For example, a red dragon is evil and breathes fire while a silver dragon is good and breathes cold. Dragons have also been prevalent in other forms of media such as movies, TV shows, and video games. These forms of media have a large reach on the society making the modern depiction of the dragon more widespread. In these movies and others that contain dragons, dragons are major participants in the plot and character development. A few notable dragons in movies include Saphira from Eragon, Smaug from The Hobbit, Draco from Dragonheart, and King Ghidorah from the Godzilla franchise. ↑ Erin C. Blake (1999). "Where Be "Here be Dragons"?". MapHist Discussion Group. Maphist.nl. Retrieved February 10, 2006. ↑ Cohen, Daniel (1989). The Encyclopedia of Monsters. Michael O'Mara Books Limited. p. 231. ISBN 978-0-948397-94-3. 1 2 3 Ørmen, Torfinn (2005). Drager, mellom myte og virkelighet (Dragons: between myth and reality) (in Norwegian) (1st ed.). Oslo: Humanist forlag A/S. p. 252. ISBN 978-82-90425-76-5. ↑ Davidson, Avram (1993) Adventures in Unhistory. Owlswick Press, Tor reprint ISBN 9780765307606. pp. 41-66. ↑ Mayor, Adrienne (2000). The First Fossil Hunters: Paleontology in Greek and Roman Times. Princeton, New Jersey: Princeton University Press. ISBN 0-691-08977-9. ↑ Mackness, B.S. 2009. "Reconstructing Palorchestes (Marsupialia: Palorchestidae) — from Giant Kangaroo to Marsupial 'Tapir'." Proceedings of the Linnean Society of New South Wales 130: 21–36. ↑ Baker, Nick. "The Dragon of Vrhnika – The Olm". Nickbaker.tv. Retrieved 2009-12-05. ↑ Drury, Nevill, The Dictionary of the Esoteric, Motilal Banarsidass Publ., 2003 ISBN 81-208-1989-6, p.79. ↑ Chad Hartsock, Sight and Blindness in Luke-Acts: The Use of Physical Features in Characterization, Brill, Leiden-Boston, 2008, pp. 193-4. ↑ Flavius Philostratus, The Life of Apollonius of Tyana, translated by F. C. Conybeare, volume I, book III. chapters VI, VII, VIII, 1921, pp. 243–247. ↑ Waddell, Laurence (1895). The Buddhism of Tibet Or Lamaism. p. 199. ↑ Freedman, Rabbi Dr. H. (translation), Maurice Simon, editor, Midrash Rabbah: Genesis, Volume 1, The Soncino Press, London, 1983, p. 51. ↑ "Isaiah 51, note 4". New American Bible. Confraternity of Christian Doctrine, Inc. 1991. ↑ People's Daily On-line (2001), "Chinese Dragon Originates From Primitive Agriculture: Archaeologist". Retrieved June 5, 2011. ↑ Guan, Caihua. (2001) English-Cantonese Dictionary: Cantonese in Yale Romanization. ISBN 9622019706. ↑ Gould, Charles. 1896. Mythical Monsters". W. H. Allen & Co.
↑ Schwab, Sandra Martina (2005). "Dragons". In Gary Westfahl. The Greenwood Encyclopedia of Science Fiction and Fantasy: Themes, Works, and Wonders. Vol. 1. Westport, CT: Greenwood Press. p. 216. ISBN 0-313-32951-6. ↑ Diderot, Denis. "Dragons". The Encyclopedia of Diderot & d'Alembert. Retrieved 1 April 2015. ↑ ago, The_Lord_ZXV created 18 Jun 2012 | last updated-5 months. "IMDb: Top 12 Best Dragon Movies - a list by The_Lord_ZXV". IMDb. Retrieved 2015-12-08. Chen, Fanfan and Thomas Honegger (eds. ), Good Dragons Are Rare: An Inquiry Into Literary Dragons East and West, Peter Lang, 2009, ISBN 978-3-631-58219-0. Schwab, Sandra Martina (2005). "Dragons". In Gary Westfahl. The Greenwood Encyclopedia of Science Fiction and Fantasy: Themes, Works, and Wonders. Vol. 1. Westport, CT: Greenwood Press. pp. 214–216. ISBN 0-313-32951-6. Smith, G. Elliot, The Evolution of the Dragon, 1919 (online text from Project Gutenberg). 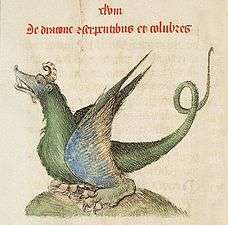 Wikimedia Commons has media related to Dragons. Look up dragon in Wiktionary, the free dictionary.